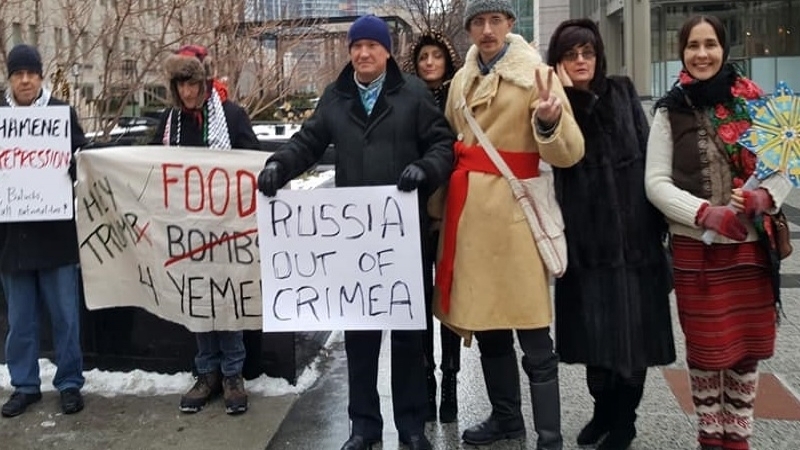 American and Russian activists in Moscow and Chicago held a joint parallel flash mob action, during which they called for an end to the annexation of the Crimea and the war in Syria. In the Russian capital, activists were holding placards: "Stop the war in Syria, Ukraine, Georgia" and "Terrorists are not Muslims of the Crimea, but invaders from the Kremlin." In American Chicago, the participants of the action wearing Ukrainian Christmas costumes made an appeal: "Russia out of Crimea"
"Round-the-world flash mob, in which we took part in Moscow. We also (like David) expressed outrage over the bombing, occupation, and death of civilians in Syria - despite assurances from the tyrant Putin that the Russian troops were withdrawn, that supposedly Syria is quiet and smooth. It's a lie! Assad and Putin are war criminals. They need to be arrested and taken to the Hague Tribunal," said American activist David Turpin. Russian activist Vera Lavrishina also published a photo from the action. Earlier, on January, 6 in the Russian city of Saint Petersburg an action was held in support of political prisoners of the Russian Federation.